Today I have a great guest post from Paola Marquez owner of Paos Fit World. She is a health and fitness blogger and sheds some very insightful light and education on fat loss for women. Fat Loss: Is It Harden For Women? Women struggle with diets more than men, with lower success rates. This shows up when we look at obesity: women in 2010 were almost twice as morbidly obese as men, and around 2.5% more likely to be any type of obese than men. Personal Trainer Paola Marquez, owner of Paos Fit World, also mentions that her Macro based diet plans are tailored for Women but she finds that Women take longer to reach their goals than men. This prompts us to ask: Is fat loss harder for women? – a topic you’re going to learn all about during this article. To start with, women hold more fat than men. The hormonal and evolutionary reasons for this should be clear: they have to give birth and the various biological differences between men and women play into women simply needing more during child birthing years. So when we look at the science, it is important to look for studies that discuss relative fat loss instead of absolute. We can’t compare the kilos lost, we need to look at the % of bodyweight. This is why we use BMI to understand population-wide trends, even if it’s not perfect for individuals. The Science: Is Fat Loss Harder for Women? 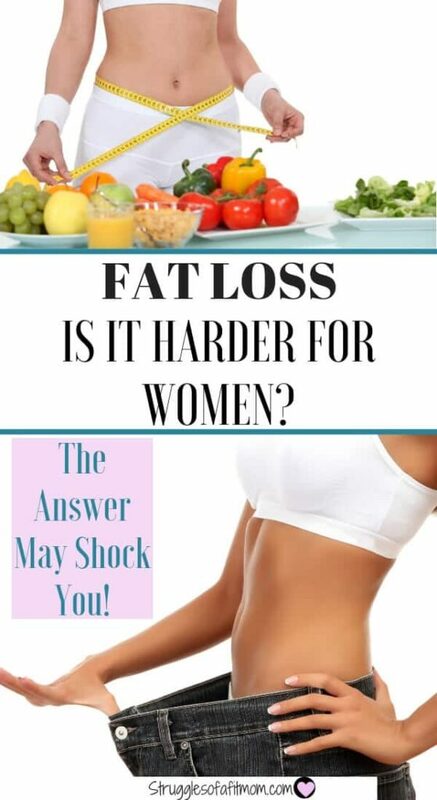 The biological answer is very simple: No – fat loss is not actually more difficult for women. The mechanisms affecting fat mobilisation and utilisation in women are directly comparable with men. The changes in relative body fat are near-identical in well-controlled studies of men and women. There are slight health differences in weight loss between the two, which we might want to attribute to the evolutionary burden of child incubation. Men tend to lose more “visceral” fat (the deep kind), while women lose more “subcutaneous” fat (the kind that sits just below the skin) – a key fact in the health differences seen between the two when dieting. Why is Dieting Less Successful in Women? In light of the fact that, biologically, there is very little difference in fat loss, how do we explain the differences in the real-world? Why do women fail diets more often? To start with, the studies that show that fat loss is identical point out the importance of controlling the diet and exercise habits of individuals to cause identical weight loss. This hints at the truth behind the problem: the way that men and women diet and exercise is totally different. Women are quicker to diet using ‘fad’ diets and other ineffective methods. They’re marketed to by diet pills, shakes, and an exercise-dominant approach to weight loss. Exercise is great, but we already know that diet is the #1 determinant of weight loss, and that women tend to respond to exercise by overcompensation with food relative to their male counterparts. This also matches with the fact that women exercise in ways that burn less calories than men. A study by Rugby Warfare shows that Male exercise tends to be around 20% more intense than female exercise during cardio when we balance it out for lean mass (a measure that already favours females due to their lower lean mass). These add up to give us a picture of dietary habits that perfectly explains the difference between men and women. Women are more likely to use diet pills and replacement shakes, while men are more likely to cut out high-calorie foods. Women focus on exercise over diet, which is exactly the opposite of what the evidence tells us they should focus on, as female behavioural responses to exercise often negate the benefits. Women exercise less-intensely than their male counterparts, which further reduces the effectiveness of an approach to fat loss that puts exercise over diet. Post-menopausal women experience more leptin-resistance when they become obese. This makes the process of combating excessive appetite more important before dieting. These are significant problems, combining some interesting behavioural problems with an approach to dieting that really adds weight to them. The way that women diet and exercise – be it the result of social pressure or marketing of unsuccessful methods – is the reason that we see these differences between men and women. To start with, it has to start at the individual level. Nutritional education is key – if only the basics. Understanding that diet is always more effective than exercise-alone in fat loss is a crucial step in adjusting the health of all people. Women will benefit from this especially. The second step is to prioritize behaviour change and deal with disordered-eating patterns. These are common in all people, but women’s behavioural changes and dietary methods right now make it even more necessary. Motivational interviewing, appetite reduction interventions and improved relationships with food precede effective dieting for most women. Finally, we need to improve the cultural accessibility of weight-training for women. Stupid stereotypes around weight training have intimidated millions of women out of the weight room when it’s one of the most effective ways of managing body weight, building muscle, and improving long-term health and adherence. The sad reality is that this is a slow process and always meets resistance at the cultural and personal level. It’s not going to happen fast, but the best thing for the process is for strong female role models in health, fitness and strength to step forward while we develop more effective nutritional education. Until there’s an effective public education on nutritional science, we’ll be cutting through misinformation and providing that type of education ourselves!